Westhill's Betsy Sachs (13) slaps the ball past Trinity's Valeria Barbaglio (19) and Jackie Derosa (26) in a girls varsity volleyball match at Trinity Catholic High School's Walsh Court on Wednesday, Sept. 12, 2018 in Stamford, Connecticut. Westhill defeated Trinity 3-0. STAMFORD — The focus of the Westhill girls volleyball team is clear. Early in the season, the team has made a point of taking nothing for granted and playing hard whether the score is close or they have a comfortable lead. 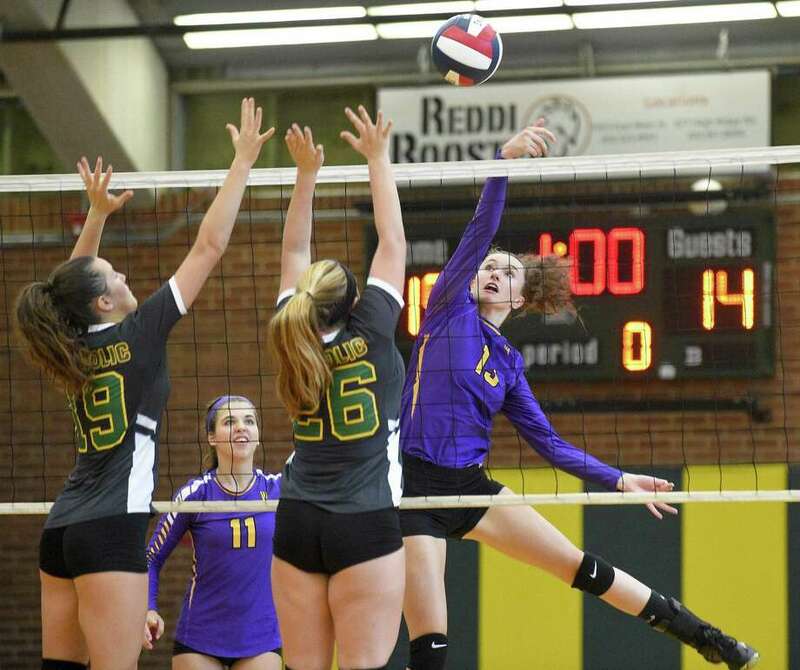 The Vikings (2-0) were certainly locked in Wednesday, defeating rival Trinity Catholic 3-0 (25-8, 25-20, 25-15). Aside from a brief Trinity run in the second game, Westhill did just that, dominating the flow of the game from the opening serve. Newcomer finished the game with 10 kills; Sophia Thagouras had 8 kills, 8 digs and 11 assists; Betsy Sachs ended with 6 kills and 7 service points; Caroline Boyd had 10 digs and 5 aces and Vana Servos finished with 10 digs and 18 assists for the Vikings. Trinity made a contest out of it in the second game, leading 16-15 before Westhill closed out the game on a 10-5 run. Trinity coach Mike Martino was pleased with the effort in the second game but said the effort was not there to open the match.